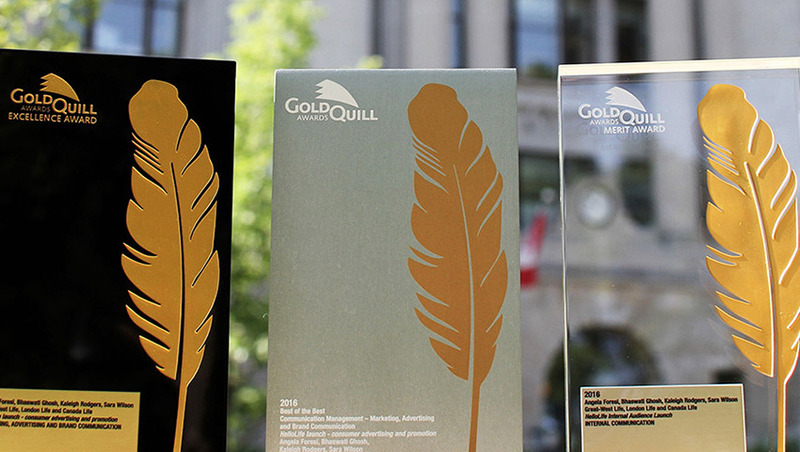 Great-West Life’s HelloLife advertising campaign received the Best of the Best Gold Quill Award by the International Association of Business Communicators (IABC) at the Excellence Awards Gala held on June 6 in New Orleans. The award, presented to Sarah Emms, Angela Foresi, Bhaswati Ghosh, Kaleigh Rodgers and Sara Wilson, recognized the best Marketing, Advertising and Brand Communication for HelloLife’s 2015 campaign. “These awards validate our significant collaborative effort towards meeting the needs of Canadians with an emotionally resonant, plain-language approach to marketing,” says Kaleigh Rodgers, Marketing Delivery. The team shares their win with many other departments and business units across Great-West Life. Together, they created a brand that spoke to clients in a language they can relate to. The HelloLife campaign focused on clear communications and financial literacy, to help clients see the value in starting the retirement conversation with their advisors. “HelloLife is a great example of what we achieve when teams from different business areas come together to put our client first,” says Rob Ritchie, executive vice-president, Wealth Management. The IABC Gold Quill AwardsOpens a new website in a new window (in English only) recognize business communication excellence internationally. The awards are presented at the IABC World ConferenceOpens a new website in a new window (in English only).